[Lord Charles Somerset and George Rose, Joint Paymasters General of the Forces.] Both men's Autograph Signatures, with those of witnesses Henry Hallam, William Stewart Rose, Henry Wrottesley and [Mark?] Blyth, to document appointing attorneys. 'this 8th. day of November one Thousand Eight Hundred and five, in the forty Sixth Year o f His Majesty's Reign'. For information about George Rose (1744-1818) and Lord Charles Somerset (1767-1831) see their entries in the Oxford DNB. The two men served as Joint Paymasters General of the Forces, 1804-1806. Rose, who was a close friend of Lord Nelson, was mocked by Cobbett for enriching his family at the public expense. The present document, witnessed by one of his second sons the poet William Stewart Rose (1775-1843), appoints his eldest son, the future Sir George Henry Rose, (1771-1855), as one of the two attorneys of his office. [Henry Hallam, historian, responds indignantly to Dr Thomas Arnold's claim that he has made 'false quotations'.] Autograph Letter Signed ('Henry Hallam') [to Dr Thomas Arnold], defending himself against an allegation made in a lecture at Oxford. 24 Wilton Crescent [London]. 28 February 1842. 4pp., 4to. Bifolium with mourning border. In fair condition, lightly aged, with short closed tears at edges of some folds. An excellent letter, indignantly countering what must be the most serious accusation one historian can level against another, that of making 'false quotations'. The recipient is not named, but from the context is undoubtedly the Headmaster of Rugby School, Thomas Arnold, who since the previous year had held the Regius Professorship of History at Oxford, and would die four months later, on 12 June 1842. Albemarle Street [ London ]. 3 August [ circa 1841 ]. 2pp., 12mo. Bifolium. In good condition, lightly aged. He begins by informing him that the accounts 'for sale of your works for the past year are being made out'., and that he hopes to send them in a few days: 'they have been delayed only until I could receive from the various newspapers the acc[oun]ts of advertising'. He continues, regarding a portrait of Hallam by Thomas Phillips: 'I have this day seen Phillips Copy of your Portrait - very nearly finished - &, as it seems to me, executed with care & accuracy'. 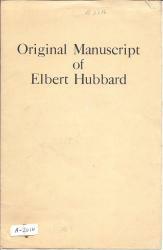 Original typescript with manuscript corrections by Elbert Hubbard, regarding Tennyson's friendship with Arthur Hallam, and with a quotation from Whitman. 12mo, 3 pp, on separate loose leaves. Forty lines. Text clear and complete. Good, on browned paper. Laid out for printing, and with the page numbering 21 to 23 (from 12 to 14). 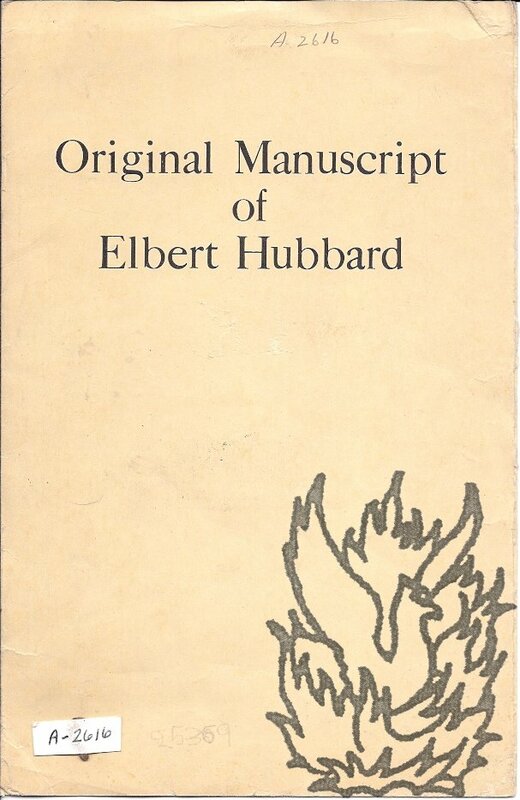 Loosely inserted in a folder with 'Original Manuscript of Elbert Hubbard' printed on the front, which also carries two accession marks. Secretarial Letter, Signed by Murray ('A. H. Hallam Murray'), to C. J. Holdsworth, responding to a criticism of an entry in one of 'Murray's Guides'. 28 January 1898; on letterhead of 50 Albemarle Street. Autograph Letter Signed to the wife of the Rev. Charles Henry Middleton Wake. Autograph Note in third person to G. S. Allan. 24 Wilton Crescent | Thursday May 2' (without year, but docketed '1844').